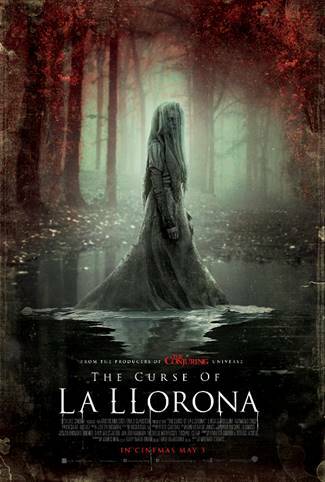 You are here: Home » MEDIA » Films » The Curse of La Llorona (horror movie: trailer). From New Line Cinema and producer James Wan, The Curse of La Llorona brings an old Latin American legend to life in a horror film, marking the feature directorial debut of Michael Chaves, the filmmaker behind the short The Maiden. As a septic serving a city of believers, Anna has navigated a multitude of phantoms and superstitions in her job, usually finding personal demons lurking beneath. So when she’s called to the home of Patricia Alvarez (Patricia Velasquez) and finds her two young sons locked in a closet, she interprets their terrified mother’s desperate efforts to keep them locked away as a dangerous sign of abuse. In the long hours of the night, a haunting cry echoes through the corridors of the children’s shelter where the two boys sleep… When their bodies are later pulled from the river, their distraught mother lays the blame at Anna’s feet, and leaves her with an eerie warning: La Llorona has her children now… but Anna’s own could be next. « Anna (action movie: trailer).